Emboldened by the institutional assault upon indigenous rights being waged by the regime of Jair Bolsonaro, rural mafias are organizing an unprecedented wave of land invasions and attacks on native territories and communities. As Brazil's indigenous agency FUNAI is systematically dismantled, with its mandate to title and monitor indigenous lands handed to agribusiness interests and religious zealots, vast Amazonian forests are becoming increasingly vulnerable to exploitation. According to a report by the Brazilian NGO Repórter Brasil, there are currently fourteen titled indigenous territories under attack. Indigenous leaders and their allies speak of a general abandonment of state protections over indigenous lands, as Bolsonaro's dangerous rhetoric emboldens a range of criminal forces – from illegal loggers and miners to land grabbers and speculators – to act with apparent impunity. Karipuna indigenous territory in the Amazonian state of Rondônia has seen a spike in illegal logging of ancient hardwoods. "These invasions will get worse," said Adriano Karipuna, a local indigenous leader who has suffered threats from the loggers. "Bolsonaro preaches that [indigenous people] do not need land, that they do not work, and that we are like animals in a zoo. Those who were already wicked enough to [invade our lands] are now receiving [the president's] support. These people now have no fear of coming onto our lands." Aside from Karipuna lands, those of the Uru-Eu-Wau-Wau and Karitiana in Rondônia also face invasions, as do the territories of the Guajajara and Ka'apor in Maranhão and the Arara and Xicrín of Pará, to cite a few flashpoints in the Amazon. The Pankararu of Pernambuco also find their territory under siege, while farmers brazenly occupy the lands of the Kadiweu people of Mato Grosso do Sul. Amazon Watch recently received news from our Munduruku partners of new invasions in the disputed indigenous territory Sawré Muybu located on the Tapajós River. Filming a stretch of devastated forests, the leader Alessandra Korap Munduruku said: "Look at what the loggers have done to our land. [This road] is enormous and leads to our sacred places." Alessandra also denounced the presence of illegal miners surrounding Munduruku territory, operating and poisoning waterways without consequence. What were already serious problems under previous administrations have become entrenched under Bolsonaro, whose rule promises to aggravate lawlessness and violence in the Brazilian Amazon. Intensifying land disputes are at the core of these mounting conflicts, as powerful actors vie for the vast, preserved forests stewarded by Brazil's indigenous peoples. According to Brazil's Socio-Environmental Institute (ISA), indigenous territories have endured nearly 450 invasions or threats by land grabbers, loggers, miners, or squatters in recent years. Nearly 220 threats to indigenous communities emanate from farmers or ranchers, while an additional 207 are attributed to loggers, according to ISA. Meanwhile, there was a 62% spike in land invasions and plundering of natural resources in indigenous territories between 2016 and 2017, according to Brazil's Indigenous Missionary Council. These statistics provide a sense of the grim reality facing Brazil's indigenous communities today, and may represent merely the tip of the iceberg. Known in Brazil as the "Bolsonaro effect," today's assault on indigenous lands has also translated into acts of barbaric violence upon native peoples. Following a dispute in late January, an indigenous Parecis man from Mato Grosso state was attacked by three men who took him hostage and tortured him, brutally beating him before slamming his arm repeatedly in a car door and leaving him for dead. The man escaped to a local village and eventually received medical treatment, but was forced to have his arm amputated. In his statement to authorities, the man claims that his assailants repeated that since Bolsonaro's election, "it is now permitted to kill indians." The attack is being investigated as a hate crime. Shortly after this event, one of Brazil's principle indigenous leaders, Rosivaldo Ferreira da Silva, known as Chief Babau, exposed a plot to murder him and his family near the Tupinambá Indigenous Reserve in southern Bahia state. Chief Babau's long standing conflict with powerful local landowners – many who are involved in land invasions of the reserve – imperiled his and his family's lives, in circumstances similar to those playing out across Bolsonaro's Brazil. And last week, three men entered the village of Joãozinho Guajajara, a prominent leader of the Guajarara people of Marananho state, and shot him before assembled youth, children and elders, terrorizing the community. Joãozinho suffered injuries, but was not killed in the attack. In what appears to be a concerted strategy to deny indigenous peoples protection and legal recourse from these attacks, Bolsonaro abruptly removed Brazil's National Indigenous Foundation (FUNAI) from the Ministry of Justice. This has blocked the agency's ability to conduct direct dialogue with Federal Police, which supports FUNAI's mission of protecting indigenous rights and defending indigenous lands. The move complicates the ability of FUNAI employees to bring environmental and human rights crimes to the attention of appropriate authorities, creating bureaucratic obstacles in a time of crisis. In addition to losing its home in the Ministry of Justice, the Bolsonaro government divided FUNAI's mission into two ministries, further undermining its ability to serve indigenous peoples. The agency is now managed by the Ministry of Women, Family, and Human Rights, which is headed by the evangelical extremist Damares Alves who has been roundly denounced by Brazil's indigenous leadership for her animosity toward native peoples as well as accused of kidnapping a six-year-old indigenous girl from her village to raise as her own daughter. With FUNAI's management in the hostile hands of Ms. Alves, one of the agency's central responsibilities – the identification and titling of indigenous territories – has been relegated to the Ministry of Agriculture, which represents Brazil's agroindustrial sector. Considered the "historical enemy of Brazil's indigenous peoples" by national indigenous leaders, agribusiness interests are actively pushing to impede the future titling of native lands and undo past titling as well. Their oversight of land demarcations therefore signifies the definitive paralyzation of these processes, undoing the indigenous land rights guaranteed in Brazil's constitution. Less than two months into Bolsonaro's presidency, we are witnessing the unfolding of a human rights and environmental catastrophe in Brazil. These impacts are being felt first and foremost by vulnerable communities. If they are permitted to advance, their enduring, disastrous legacy will impact us all. 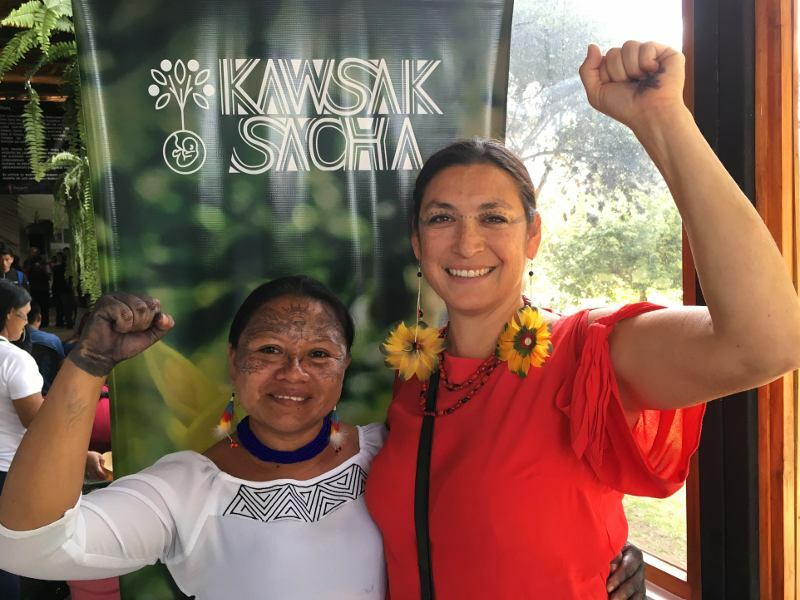 Amazon Watch continues to increase its capacity to work in solidarity with indigenous allies in Brazil and will continue to target international forces that enable Bolsonaro's destructive plans for the Amazon. We must continue to grow international awareness around this crisis in Brazil and heed our allies' call for increased solidarity and action.